“When we used it, the project plans ran to scores of pages with hundreds of tasks and we didn’t have a clue about what was going on”. “Project gives funny answers. ” they say. Those who don’t use Project because of these issues, then report proudly how they keep it “simple” by using Excel and, if they use Project it’s only to do a Gant Chart that they paste into PowerPoint. That floors them. “That can’t possibly be enough detail”, I hear. I think that level of detail for most organisations is much better than projects with hundreds of trivial or individually-managed tasks, or projects “planned in PowerPoint”. Maybe once 1-line project plans are achieved, you can move on to 5 or 6 line project plans. But no more. Project computes the total cost, based on the billing rates for the above people, to be £133k. They now don’t have just a simple one-line project, but they have a much richer understanding of eight activities, all which have time demands on the organisation. Without going into all the details here, you now have all the capabilities of Project go look at deadlines, milestones, resource planning, etc. Project handles all the complicated time-based computations. If one resource file is used, we can use the built-in capability of Project to show resource commitments, clash, over/under allocation. Simple scheduling can start to occur, for example make sequence the 8 projects in some sort of order–not by priority by but by successor/predecessor links. Let Project do the work of telling you when the projects will get done. If you don’t like the answer, then change the plan. I was a fluid mechanics lab instructure while in graduate school in the ’70’s. The favorite experiment we did was to demonstrate “Non-Newtonian” liquids by mixing cornstarch with water. The mixture has amazing and fun properties. Always a hit with the students. Sadly, we could never explain how it worked other than to say it was “Non-Newtonian”. Science Friday has video both demontrating and explaining it. I especially like the idea about tryingit out on speakers. 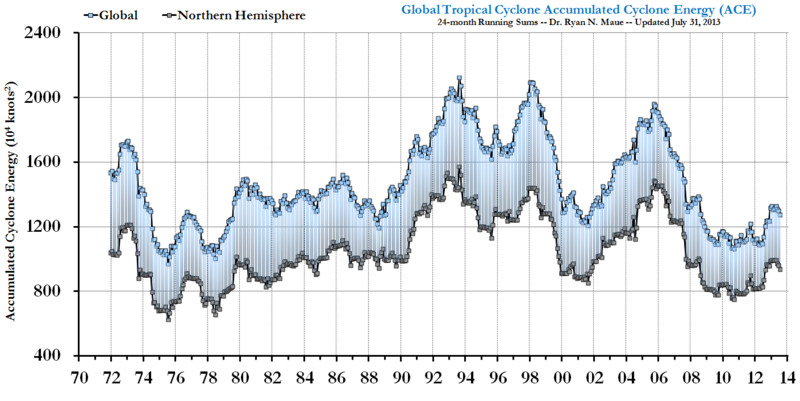 Global Warming News Flash: Global Hurricane Activity Reaches 30 Year Low! Food for thought when we think of the media message on climate change projections. SharePoint Joel writes on the future of documents, and concludes their days are numbered. What is a document? Is it that restrictive format that has a bunch of text in it with all that formatting to make it presentable? Sometimes they get corrupted. Not so much as the late eighties, but really what is a document is it the file? Is it the format? Is it the information inside of the document that is what really defines it? The .Doc and .DOCX today is simply a description of the text and layout of the information in the file. Putting information into a .doc is like throwing something in a closet. The closet might get opened again, now put it in a folder and it’s like putting it in a filing cabinet in a closet. Nest those more and more and it’s likely to never be read again. SharePoint to the rescue and search might make those stats more likely to be found. Meta data and all that jazz will again increase the likelihood of it being read again. I’ve learned that we don’t need most documents that are created and emailed in Corporate Land. We don’t need them and we don’t need to invest to make, publish, read, store, or retain them. We probably need some of the information, and that information needs to be put into places which work better. Those places are being discovered. They also studied the relation between the names of amusement park rides and the expectation of excitement. Yet more proof of the irrationality of risk management by most people. A few weeks ago a friend of my son invited many of her school friends to a party via an internet site that promised to inform everyone. Indeed, emails were delivered to everyone. The emails contained attachments. Most everyone opened the attachments. Most everyone’s computers got infected and commenced delivering mail to everyone in their contact lists in MSN. Everyone, that is, but my son. He knew my message of “don’t open attachments in email unless you are very sure.” That message was drilled into the family the earliest age. He ignored the first email about the party–probably didn’t want to go anyway. He ignored the scores of emails from all his “friends” which were generated and propagated by the malware on their machines. He smiled when he told me all this. He is, however, chagrined to report that the only way his friends and their parents could stop the deluge of outgoing emails was to shutdown the machine. Further, he hears that some of the machines will no longer work. That cuts into their collaborative game playing (Football Manager). You are currently browsing the Musings on Interesting Things blog archives for March, 2009.